The Adamson M215 monitor delivers everything you want and more in a conventional stage monitor: extremely high-power and high-performance with zero distortion. The trapezoid enclosure features symmetrical driver placement with a 50° conical waveguide resulting in outstanding directivity control. 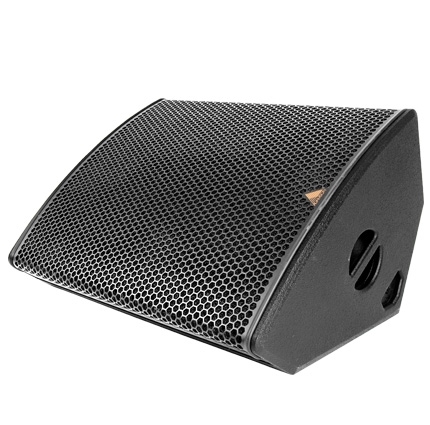 Designed for use as a stage monitor, it can also double as a superior drum or stage-fill enclosure, specifically aimed for performers wanting extra high SPL without losing intelligibility. The M215 exhibits remarkably low distortion thanks to the superior qualities of its multi-layer Kevlar cone driver. The two long excursion, light-weight Neodymium ND15-L drivers supply exceptional power handling with a rock solid low frequency response. Together, the brand new surround design, and Adamson's Advanced Cone Architecture, make the ND15-L the only 15” driver with zero axial modes in its entire passband, dramatically increasing the linearized mid-band response. The cone design also enforces extreme durability in wet conditions making the M215 an ideal solution for outdoor events.